Why push up daisies when you can serve up ribs? 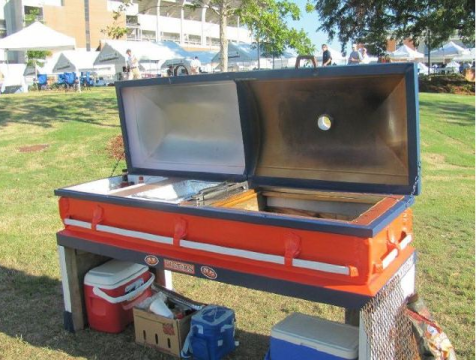 Via our new, good friends / best Auburn message boarders at AUFamily. * Best Pat Dye commercial ever??? If someone bought this casket because they got cancer and thought they were going to die, then beat cancer (or something along this line) and turned it into a grill to celebrate life etc. then I’m ok with it. Otherwise I find it rather morbid. Under any circumstances this is creepy. Maybe they own a funeral home or something? Does he have a bbq apron that reads “I’d rather be cremating”? 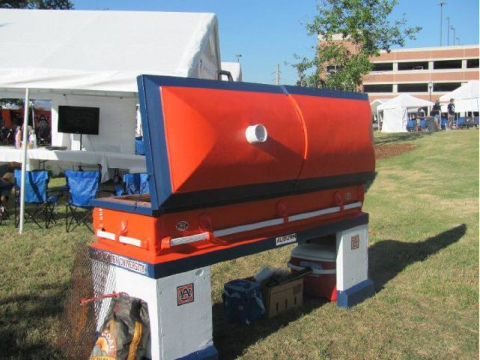 Reminds me of the float that got banned from the 1989 Beat bama parade right before the parade started (I don’t remember which fraternity built it)… featured a see-through coffin with a Bryant-on-a-spit inside, spinning around and around and around. I love my AU family but I agree with Tigertracker. Is that a RED cooler under that thing?!? You know? Those ribs tasted a little different. These are actually somewhat common. I’ve seen a few here in texas. Having said that, I wouldn’t want it.